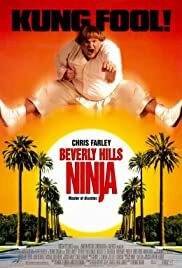 Is 'Beverly Hills Ninja' Really Christian Bale's Favorite Movie? Haru: Do not worry. A ninja knows when he is in danger. Haru: Now we are in danger. We are really in danger. Gets Better Every Time I See It. Please forgive the length of this first paragraph, but it is needed to explain my opinion of this film. I never saw this film in the theater; it looked a little silly to me. One day a few months later it came on pay-per-view. Due to a technical glitch the cable company unscrambled the pay-per-view channels all day long. It also happened to be raining and generally miserable out, so my buddies and I decided to watch this movie. We had three pay-per-view channels, and one of the channels showed a single movie all day long. Guess which movie it was. The first time we watched it, we thought it was goofy, even stupid, and didn't really care for it. However like many teens, we mindlessly watched it again . . . and again . . . and again. We watched this film all day. "Why?" you ask; because it truly gets better every time you watch it. I think the reason is because this is a stupid film, and when you first watch it, you're too smart for it. Eventually though the IQ points seep out of your head, and you're able to fully enjoy this great movie. The bottom line: Watch this film at least 5 times, not necessarily back-to-back but it helps. It will grow on you. Even if you don't like Farley, watch this film for Chris Rock. Rock's performance is perfect, despite being too small of a role. 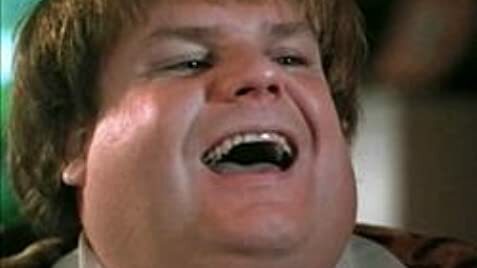 Farley's performance is perfect as the bumbling but good-hearted "Great White Ninja." Even the chicken's performance is perfect. If you find the concept of a fat, white ninja involved in an Asian gang war mildly provocative, check your brain at the door and enjoy.